The General Manager brought a spider to me this morning. His family had caught it the night before and were impressed by its size. It was sealed in a glass with considerable quantities of tape and elastic bands. Houdini would have had trouble escaping. I quickly identified it as a Wolf Spider. I am not sure which of the many species of wolf spider found in New Zealand it is. If you know send me a message. The wolf spiders are hunting spiders and stalk their prey by stealth and quick movement. They possess good eyesight and hunt mostly at night. They are unusual in that some species the females carry their eggs in a silk sack on their abdomen. They may even carry the young hatchlings with them until they can fend for themselves. This particular individual has a body of about 12mm and the from tip to tip of its hairy legs was as much as 50mm. These are not dangerous spiders. 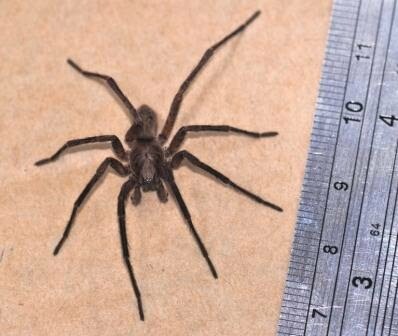 There are few dangerous spiders in New Zealand. The Whitetail Spider is reported to bite frequently and in some cases causes severe reaction and perhaps ulceration of the bite site. The native Katipo is a relative of the Australian Redback and can, like its Aussie cousin, give a nasty bite which can in some very rare cases be fatal. The Katipo is non-aggressive and rare. It is found only in sandy areas near the coast. You've heard of tarantulas and their tarantella dance. Well other spiders do the fang dango. The Indian summer that we have enjoyed over the past months seems to have extended the period that borer beetles have been on the wing as adults. This means that there is still time to use borer bombs (NO Bug Borafume) to knock down the adult beetles and stop them laying eggs on timbers such as your sub-floor. However, the long term treatments for protecting your floor, wall and roof timbers from borer attack can be carried out at any time of the year. Treating timbers with NO Borer Concentrate or ready to use fluid or NO Borer injector controls the borer larvae that do the damage inside the wood and prevent adults laying eggs on the wood. Such treatment can give more than 10 years protection to timbers. Damage of sub-floor and weather board timbers are the most likely and the easiest to identify. Flight holes are easily seen in the exterior of painted weather boards, sofits and barge boards. The holes are between 1mm and 3mm in diameter. These are created where the borer larvae pupate near the surface and the adult beetle eats its way out, usually between October and March. 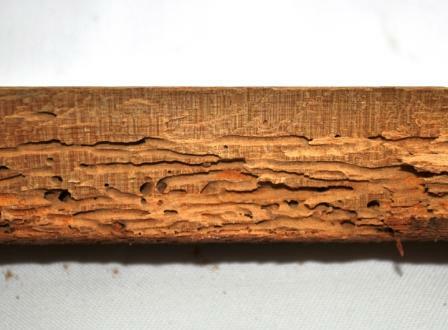 There are likely to be many more flight holes on the internal surfaces of weatherboard timbers than on the exterior and on sub-floor surfaces than top surfaces of floor timbers. As you can see in the photograph above borer can cause considerable damage to timbers without many flight holes being visible. In the photo of a floorboard the damage is largely limited to the lower half of the board. This is because borer prefer to emerge in dark areas away from light and they prefer a little moisture in the timber that comes from the ground below. The adults beetles mate and the female looks for bare untreated timber to lay her eggs. Often she will lay the eggs in an old flight hole. So treatment of flight holes with a NO Borer Injector will deny the flight holes as places of re-infestation. "Woodworm hole be enough or would you like two?" Requests for advice from Kiwicare on how to get rid of grass grub are soaring. There has been a surge in visits to the website from people searching for help. This is probably due to the weather conditions putting extra stress on grasses and other plants with damaged roots due to grass grub. This shows as unsightly patches of dead grass on lawns. 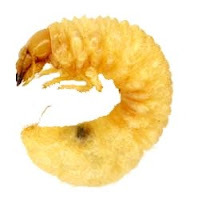 Grass Grubs are the larvae of a scarib beetle (Costelytra zealandica). The beetles lay eggs on pasture and lawns in spring and summer. From January through to October the grub that hatches out feeds on the roots of grasses and other plants in the garden. Grass grub can cause considerable damage to lawns and vegetable plots. They are regarded as the major insect pest of agricultural pasture and are a pest of major economic significance in New Zealand. The grubs are usually found about 15cm below the surface and control of the grub requires getting insecticide to this level in the soil. Kiwicare NO Insects Lawngard Prills are formulated to slowly release soil insecticide deep into the soil with watering and rain; giving good control and protection of roots. The adult beetles feed on the leaves of many plants and can also cause severe damage if present in large numbers. 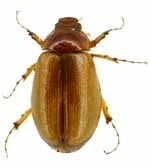 The beetle or adult stage is a rich brown colour and has a hard, shiny covering. This is the time to get into the garden and get rid of the grass grub to protect your lawn and to prevent the hatching of adult beetles in October/November. 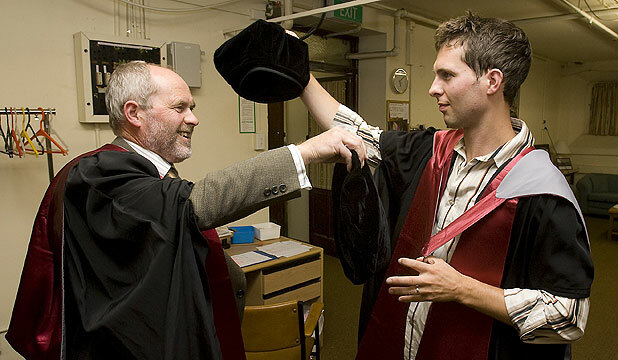 Reuben Jane has been working for the Kiwicare R&D department for several months following the completion of his doctoral theses at Canterbury University. We are very pleased that he is to be awarded his PhD in chemistry and in a fantastic day for the Jane family his farther is also to pick up a PhD in music. Congratulations to both from all at Kiwicare. Read more in the Press. Doctor, doctor! I think I need glasses. You certainly do. This is a fish and chip shop. Meanwhile, my assistant Rachel has been winding me up this week by emailing photos of her watermelons. We both sowed the golden-fleshed cutie 'Baby Doll' in spring but, whereas mine came to nothing (I got a few flowers but no fruit), Rachel's proved to be a star. She planted hers in a pot and despite a serious lack of water over the Christmas holidays, it set three little green melons that fattened up nicely. I think the secret was feeding. Rachel says she gave her plant a weekly dose of Kiwicare's Organic Fertiliser (this stuff pongs to high heaven but works wonders). 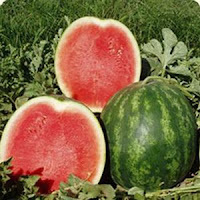 'Baby Doll' melons are the perfect size to eat in one go so Rachel reckons she'll definitely be growing more next year. As for the taste? Uber-sweet and seriously juicy, apparently. I followed this up by contacting NZ Gardener to tell them how happy were to hear how well our Organic Fertiliser makes melons grow. I’ve been using it on most of my plants since Ange gave me a bottle to try, so thank you for that. It’s so nice to have products out there that actually work. I’m currently in love with the NO Caterpillars product. My chinese greens are actually hole-free for the first time ever. For the archive of the Get Growing newsletter click here. Following on from yesterdays ‘quickie’ comment on the very large wasp nest discovered in a Gisborne loft. This demonstrates quite well what can happen when animals or plants are introduced to new environments. They may find the new environment more suitable to them than the environment in which they evolved. Wasps (German and common) were accidentally introduced to New Zealand, probably from the US and Europe. Both species form nests out of a papier-mâché like substance made from chewing wood. A large nest in their native lands would be beach ball size and contain four to five thousand wasps. Each winter the colony is reduced in number, perhaps leaving only the queen. The queen abandons the old nest to found a new nest in spring. However, in New Zealand the colonies are able to survive in large numbers through the mild New Zealand winter and a ‘super’ nest such as that found in Gisborne is formed by continued use of a nest for more than one season. The Gisborne nest may have contained as many as ten thousand wasps. As well as the mild climate, wasps take advantage of the available food sources New Zealand provides; in particular the honey dew from the scale insect found on native beech trees. Wasp numbers in beech forest can reach extraordinary densities as many trampers will testify. 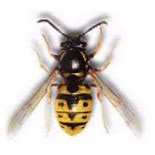 Wasps are not just a nuisance when you are having a barbecue or tramping through the bush. Many people have allergic reactions to stings that can be life threatening. Wasps are also an enemy to honey bees and will fight a ‘war’ with a honey bee hive in an attempt to steal the bee’s honey store. Bee keepers regard wasps as one of the major causes of reduced honey production. Wasps also damage the New Zealand ecosystems by preying on insects and have even been seen killing newly hatched birds. You can help reduce wasp numbers and protect New Zealand’s ecosystems and New Zealanders by destroying wasp nests wherever you find them. I have mentioned wasps several times in this blog before. But the number of enquiries about how to get rid of a wasp nest is three times the peak of last year. 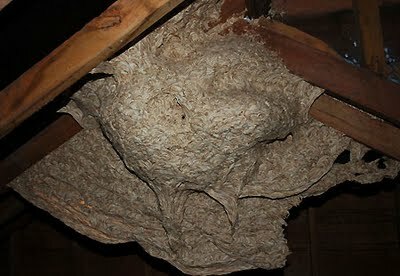 The Gisborne Herald reported yesterday on the discovery of a Super-sized wasp nest found in the roof void. If you want to know how to safely deal with a wasp nest go to the Kiwicare Wasp and Bee page. I've just had this 'brilliant' idea! It takes quite a lot of effort to communicate by cell phone or computer. All that connecting and typing on sometimes tiny keys. On the cell phone the predictive text spells spurious words (just ask the people I text) or if you don't use predictive text then you may have to press a button as many as four times to get one character. How much easier would it be to get a communication device that creates the message from our spoken language? Wouldn't it be great if we could have a computer or cell phone program that can recognize our voice and convert it to the words in text? How about a device that actually transmitted the voice message itself? This would have the great advantage of transmitting, not just words, but inflection as well. I want to patent the idea. I think it has great potential and has the possibility of superseding twittering, email and even texting. Kiwicare is in the vanguard of this communication revolution and if you type 03 389 0778 into your cell phone or home phone you will be connected by instantaneous 2 way voice message to the Kiwicare offices where experts will be able to help you by answering, in real time, questions you may have on pest control, garden care or Kiwicare products. If, on the other hand, you want to continue with the old technology of the electronic written word, you can still contact us by using info@kiwicare.co.nz using email. Or Twitter to Kiwicare at http://twitter.com/Kiwicare or even text 021 395 569. I watched TV3's Target program last night with interest. The investigative program carried out a hidden camera survey of four Tauranga Motels. One of the motels was criticised for leaving a Kiwicare Cockroach trap below one of the beds in the unit. The trap had successfully caught a cockroach and this was not a ‘good look’ for the motel. The motel staff should have removed the trap when the unit was occupied or, I would suggest, moved it to a place where it would not be encountered by guests. I think the program should have applauded the motel for at least being proactive in monitoring for cockroaches and other crawling insects in the units. The Kiwicare Cockroach Traps are BioGro certified organic and provide safe and effective control of cockroaches without the use of insecticides. However, the fact that the cockroach was caught in the trap should have alerted the staff to the infestation and a treatment with NO Cockroaches spray or NO Bugs Super would have given better protection to guests and the reputation of the motel. 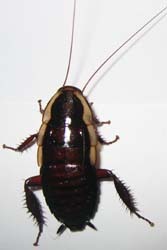 Cockroaches are a considerable pest in many parts of the North Island and north of the South Island where cockroaches find the warm and humid climate to their liking. Anyone in these areas it at some risk of encountering pest cockroaches wandering into their homes or workplaces or being brought in on boxes or other goods; I suggest being proactive and using simple NO Cockroach traps to detect and control cockroaches as soon as they enter. If cockroaches are found then a cockroach control program can be done to prevent an infestation establishing. I pulled a muscle in my lower back and am now sitting bolt upright at my desk trying to think of ways to get my mind off the throbbing pain.............well this isn't working................It would not be so sad a tale if I could claim to have hurt my back while scoring a try or bungee jumping or some other manly extreme sport. But I hurt it leaning over to dry my foot on leaving the shower. Violins please! I have over the last few weeks answered questions from several people concerned with the control or eradication of hide and other dermestid beetles. These are beetles whose larvae bore into a variety of materials. Hide or larder beetle bore into hides, leathers, dried larder goods. 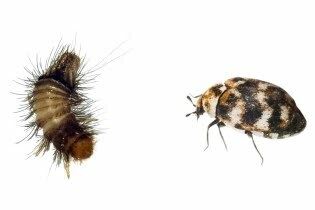 Carpet beetle larvae feed on wools, silk, fur and other natural animal fibres. The damaging larvae of these beetles are often referred to as woolly bears because of their hairy look. Treatments with NO Bugs Super or similar synthetic pyrethroid products with a good long term action of three months or more is sufficient to get rid of these pests. The life cycle is approximately 2-3 months so larvae or adult beetle are likely to contact active areas of treatment and be controlled. NO Fleas Total containing insect growth regulator (IGR) can help break the life cycle by preventing eggs, larvae and pupae reaching adult maturity. I was lucky enough to be taken to a great concert last night. Carol King and James Taylor played the Westpac Stadium in Christchurch. Those in the audience that had hair were sporting a few grey ones, so I fitted right in. We enjoyed nearly three hours of hit after hit from two of the greatest singer songwriters. It was the seventies when they both wrote some of the decade’s most memorable tracks but they have not lost any of their talent as performers. James Taylor and Carol King is a marriage of two musical kindred spirits and they have chemistry between them that makes for great music together. Who is next in concert in Christchurch? Before the concert I had a delicious meal at the Two Fat Indians restaurant in Merrivale. I am very partial to Indian cuisine, a hangover from my father’s cooking. He was in the Indian Army during WWII and brought considerable tolerance to hot food home with him. When he made a curry from first principles we kids knew we had had a curry. 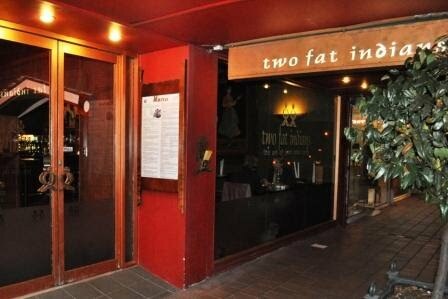 At the Two Fat Indians one gets an authentic taste of India. I had a scrumptious Fish Bengali dish and a mouth watering Chicken Hyder. I would strongly recommend both. Do you know? Kiwcare has an excellent BioGro certified crawling insect barrier made from capsaicin the hot chemical in chillies. Organic NO Insects Barrier can be painted around entrances to a house to keep out ants, cockroaches and other creepy crawlies.......and no use of insecticides! The wasp season has started in earnest. I mentioned in a previous blog (Angry Wasp Season) that the wasps did not appear to be as prevalent this year. Perhaps I should not have tempted the fates. Over the Easter break there has been a huge spike in visitors to the Kiwicare website seeking help and advice on dealing with wasps and wasp nests. Yesterday saw twice as many people seeking our wasp page as any other day since I started tracking the number in July 2008. I will be monitoring the level of interest in everything 'wasp' over the next few weeks. If you want to learn how to get rid of wasps and wasp nests take a look at the Kiwicare website where you will find a lot of useful advice. On my travels over the Easter break I noticed another insect pest that is late in being an issue this year. Cabbage White Butterflies were in abundance as I drove around the country. When I stopped at one restaurant which had a dedicated vegetable garden I noticed the damage done by the caterpillars of this butterfly. They had eaten holes in all the brassicas (cabbages, sprouts, kale, and broccoli). A simple spray with BioGro certified Organic NO Caterpillars would have saved the crop from this damage and not had any effect on the ability to use the veges in the restaurant as there is no withholding period. Caterpillars will continue to damage vegetables and other plants for a month or more yet. So get out and protect them now. I will.